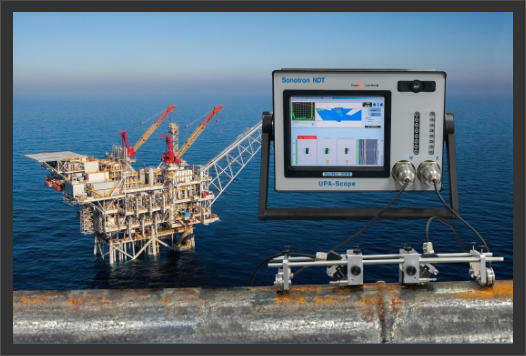 The ISonic 2009 UPA Scope is a Powerful, Superior Performance Portable Smart Phased Array Ultrasonic Flaw Detector and Recorder with 1 / 8 / 16* Additional Channels for Conventional UT and TOFD. ISonic 2009 - UPA Scope - Portable Phased Array Ultrasonic Flaw Detector and Recorder Designed and built under the drive for improved detection, productivity, and reducing of inspection cost. 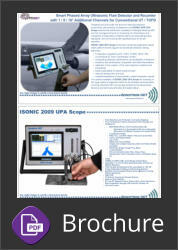 ISONIC 2009 UPA Scope uniquely resolves the well-known nowadays challenges faced by NDT and QA management such as increasing of nomenclature and complexity of inspections combined with more demanding codes, standards, and norms along with significant loss of domain expertise. Phased Array Modality • 64:64 phased array electronics organized as 1 X 64:64 or 2 X 32:32 - independently adjustable emitting and receiving aperture, parallel firing, A/D conversion, and on-the-fly real time digital phasing • Phased array pulser receiver with image guided ray tracing • True-To-Geometry and regular B-Scan and Sector Scan (S-Scan) accompanied with all-codes-compliant A-Scan based evaluation • Unique Tandem-B-Scan for the detection of planar vertically oriented defects • Built-in automatic coupling monitor and lamination checker for wedged probes • Multi-group / dual side scanning and imaging with use of one probe • Encoded / time-based line scanning with Top (C-Scan), Side, End Mapping and 3D Viewing • Independent gain per focal law adjustment: pure angle gain compensation for S-Scan, etc. • DAC, TCG • Processing of diffracted and mode converted signals for defects sizing and pattern recognition • Operating matrix-array probes with real time three-dimensional imaging (3D-Scan) Conventional UT and TOFD Modalities • 1, 8, or 16 channels • Single / dual modes of pulsing/receiving • Regular A-Scan • Thickness B-Scan • True-to-Geometry flaw detection B-Scan – straight / angle beam probes • CB-Scan • TOFD • Strip Chart and Stripped C-Scan • Parallel or sequential pulsing/receiving and A/D conversion • DAC, DGS, TCG • FFT signal analysis • 100% raw data capturing • Powerful off-line data analysis tool kit • Intuitive User Interface • Light rugged case • Sealed keyboard and mouse • Large 8.5” bright touch screen • Ethernet and 2 X USB Ports • Remote control – UT over IP • Built-in encoder port ISONIC 2009 UPA Scope uniquely combines phased array, single- and multi-channel conventional UT, and TOFD modalities providing 100% raw data recording and imaging. Along with portability, lightweight, and battery operation this makes it suitable for all kinds of every-day ultrasonic inspections. Phased array modality is performed by powerful 64:64 phased array electronics organized as 1 X 64:64 or 2 X 32:32 with independently adjustable emitting and receiving aperture, each may consist of 1 X 1…64 or 2 X 32:32 elements. 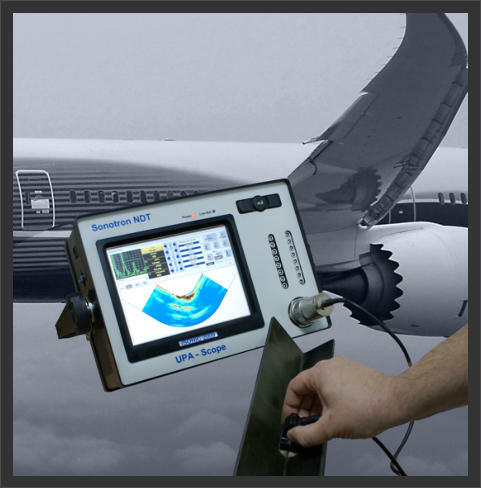 Groups of phased array probe elements composing emitting and receiving aperture may be fully or partially matching or totally separated allowing flexible managing of incidence angles, focal distances, types of radiated and received waves including directly reflected and diffracted mode converted signals. Each channel is equipped with it’s own A/D converter. Parallel firing, A/D conversion, and ”on-the-fly” digital phasing are provided for every possible composition and size of the emitting and receiving aperture. Thus implementation of each focal law is completed within single pulsing/receiving cycle providing maximal possible inspection speed. Depending on configuration ISONIC 2009 UPA Scope carries 1, 8, or 16 additional independent channels for conventional UT and TOFD inspection and recording capable for both single and dual modes of pulsing/receiving. High ultrasonic performance is achieved through firing phased array, TOFD, and conventional probes with bipolar square wave initial pulse with wide-range-tunable duration and amplitude. Maximal amplitude of bipolar square wave initial pulse is 300 V pp for phased array and 400 V pp for conventional channels. High stability of the amplitude and shape of the initial pulse, boosting of all it’s leading and falling edges, and electronic damping are provided by the special circuit significantly improving signal to noise ratio and resolution. Thus analogue gain for each modality is controllable over 0…100 dB range. Large 800X600 pixels 8.5” bright screen provides fine resolution for all types of inspection data presentation.